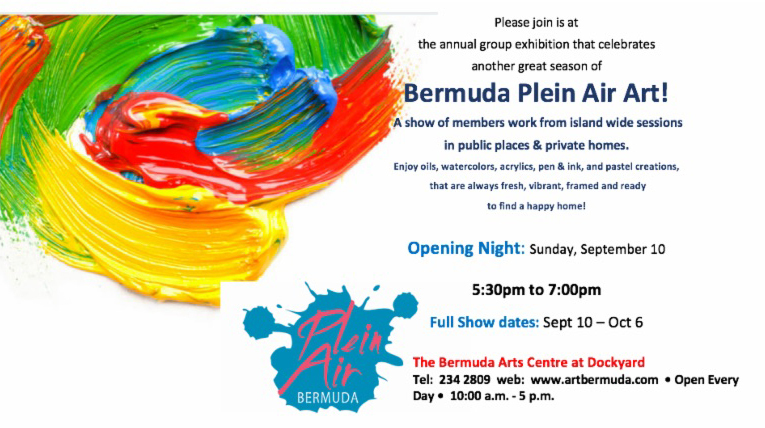 The Bermuda Plein Air Group will open its 15th art exhibit on Sunday, September 10, with the exhibit continuing to run until Friday, October 6. The opening will take place from 5.30pm to 7.00pm at the Bermuda Arts Centre at Dockyard. A spokesperson said, “The Bermuda Plein Air Group will open its 15th art exhibit on Sunday, September 10, with the exhibit continuing to run until October 6. “The opening will take place from 5.30pm to 7.00pm at the Bermuda Arts Centre at Dockyard. “The Plein Air Group of Bermuda meet every Sunday morning from September to June to paint at a different location throughout the Island. The show reflects 10 months of work created in all media. “The show is a documentary of Bermuda as the year has passed from beautiful sunny mornings to ominous skies. “At this show, one can expect to see everything and anything that has been captured around the Island. Work is presented in all media and sizes. It leads the viewer through garden paths, past historical homes, and into the water. Some scenes are easily recognised, others will have one asking where this beautiful home lies.